Sometime in April 1971, my brothers took me into the Cork 'N' Bib Liquor Store in Granada Hills. I had a dime to spend. I used it to buy my first back of baseball cards. There were ten cards in the pack, the only I remember being a card of Phillies pitcher Fred Wenz. I would enjoy collecting baseball cards, although my brother Tom was the custodian of a fairly large collection. They were a fun part of my childhood. But, for author Josh Wilker, who collected most of his cards in the mid to late 1970s, baseball cards are more than just pictures of long retired players, they are his way to relate to us the story of his life, growing up, as so many of us do, with an artist mother living with a guy in Vermont who aspires to be a blacksmith while his sociologist father stays behind in New York City. And after spending the past few years on a blog (including for a time along with me at Baseball Toaster), there is now Cardboards Gods, the book, from Seven Footer Press. You can read an excerpt at ESPN.com. The dust jacket has blurbs from the likes of Rob Neyer, Will Leitch, Bill Lee, and David Cross. Josh sat down with me for an interview by e-mail. Well, I assume he was sitting. If not, he did a lot of typing while standing up. describe what Cardboard Gods is about? childlike joy from the cards and thread it through my life. Also, I wanted to hold on to that brief span of years that was my childhood, and the cards helped me do that. So I guess maybe that's a long-winded way of saying the book is about a guy holding on to his baseball cards throughout his life. Q. When you started the blog did you have any order set out for the way you picked out the cards or the stories around them? The book has a much more linear progression of your life? Was it easier or harder to organize that? I didn't have any order set out when I started the blog. I just wanted to play around. I kept with this basic approach as I began to generate on the blog a lot of the material that would later develop into parts of the book. (And I still use that approach on the blog as the practice of writing about all my cards continues.) I wanted to retain in the book some sense of a ranging, digressive feel in the blog, which actually more closely resembles the shapeless, associative meanderings of memory, but I also wanted to have the book work as a whole unbroken start-to-finish story. It was hard work, but good work, to take the raw materials I'd produced in notebooks and in the blog and in other earlier story-writing attempts and shape them into a start-to-finish story. Q. How does your family feel about the stories about their lives being described first in your blog and then later in print? I think it definitely helped to ease everyone into it in the sense that the book was not the first time they ever saw writing of mine about family history. Even before the blog, I'd shared a lot of work with them that got into some pretty intimate family situations. They all are very supportive of me, and there's a long, strong tradition in my family of putting a lot of value on books and art, so I have always gotten a lot of encouragement to "follow my muse." My family also understands that this is all just my version, and not the "truth" about anything that happened to any of us. I really wanted to champion my family in the book. The cards are the gods, but the members of my family are the heroes. I hope that comes through. I think my family gets that I was trying to do that. Q. Is there a particular year of baseball cards that you like from either an aesthetic of personal level? I bought my first set of cards in 1971 and I didn't like them at the time, but I think they look good now. I'm really fond of the 1972 set because it was so big and weird features like the "in action" cards and "boyhood photos of the stars." Nothing makes a kid happier than to see a picture of Jim Fregosi playing the accordion. I think you missed the era when the cards came out in series and only certain players were available during the year. 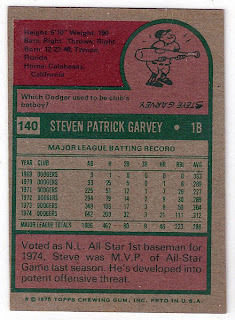 Yes, I really wish that I could have been old enough to collect the 1972 cards--they are my favorite of the cards that I just missed. As for my favorite of the sets that I did collect from 1975 through 1980--with a little bit of spillover on either end to 1974 and 1981: I'm honestly not sure if I identified a favorite at the time. While I was collecting, my favorite year was whatever the current year was, because that was the year that was newest and most exciting and that could bring new versions of superstars into your hands. As I've been reliving the years, I feel the same difficulty about picking a favorite year, but for different reasons. Now it's more like a parent trying to pick a favorite child. But in my gut I know that the 1975 set wins out. It was my first full year of collecting, so no set could ever have more of that feeling of newness, and the cards themselves had those brightly-colored borders. Also, they were often off-center, which made them somehow more familiar and friendlier. They weren't all slick and unapproachable, those 1975 cards. Also, they had trivia questions with upside-down cartoon answers on the back. Q. You are a Red Sox fan now living in Chicago. Do you have any empathy for Cubs fans and their even longer wait for a World Series victory? Yeah, I sure do. Not only have they had the longest wait, they've also had to suffer the indignity of watching the Red Sox and the White Sox jump the line on the Cubs and end their own long championship droughts. A few years ago, I envisioned the Cubs, White Sox, and Red Sox clumped together with their thick glasses and acne and aura of desperation at the reject table in the high school cafeteria. The Cubs are now at the table all alone. I'm pretty neutral when it comes to the teams of the city I now live in, but I love going to games at both places and feel especially lucky whenever I can spend a few hours at Wrigley. It's a great place, although one Cub fan I sometimes see on the bus to work tells me that it's going to crumble to the ground one day in the not too distant future. I hope they win one before that happens. Q. The dust jacket has a blurb from Bill Lee on it. He is one of the "gods" in the book? Have you ever had any contact with any other player who is in the book, other than Don Stanhouse? Or is it better for your gods just to remain gods? I guess I'll get a chance to meet Bill Lee when I go back to the northeast to do some book tour stuff. I'm really looking forward to it, both because it's a childhood dream come true and maybe more importantly because he seems like someone I might be able to relate to. I don't know how much I could relate to other players from the old days. And I think that I'm no longer yearning to bridge the distance between me and the gods. When I was a kid I dreamed of meeting Yaz (Carl Yastrzemski is an integral figure in the book), but now I understand that the version of Yaz I created in my head is every bit as important to me as the "real" Yaz could ever be, and if I was to meet Yaz, maybe that imaginary version would disappear. Q. I got a pack of baseball cards at Dodger Stadium. It had a Jimmy Rollins card in it. It said one of his biggest thrills was getting the game-winning hit in Game 4 of the 2009 NLCS. Is there a way I can create an alternative life for him like you did for Bucky Dent? First, get rid of that card! It's never good when attempting to erase events from your mind to have evidence of those events lying around. After that, you're just going to have to let your imagination take over, kind of like letting thick, unruly weeds take over a garden. In other words, you need to kind of go a little crazy, a little glassy eyed, a little mumbly, and voila, eventually Jimmy Rollins will have shifted his role in the annals of the game to, say, that of a little-known rookie who was the second player in MLB history to ever be run over by a tarp machine, after Vince Coleman, and the first to (depending on your level of anger) A) have his career seriously hampered by it, B) have his career ended by it, or C) have his life ended by it. Josh Wilker will read from Cardboard Gods at the South Pasadena Public Library on June 10 at 7 pm as part of a Baseball Reliquary program. The Jimmy Rollins card has been disposed of appropriately.